Ready to build that patio you’ve been dreaming of? Not too many years ago, a typical paver patio was square or rectangular, built of brick shaped pavers typically in the red color family and were often relatively small. Take a look at the patio photo gallery on this website and you will see every shape, color, size and variation. Today’s patios seem to celebrate the freedom that comes with working with smaller building elements such as pavers and stones. Today’s patios often have fabulous custom shapes and are often paired with other structures such as a deck or porch. How does your patio or hardscape take shape? Your new paver patio or hardscape is just that – completely yours. 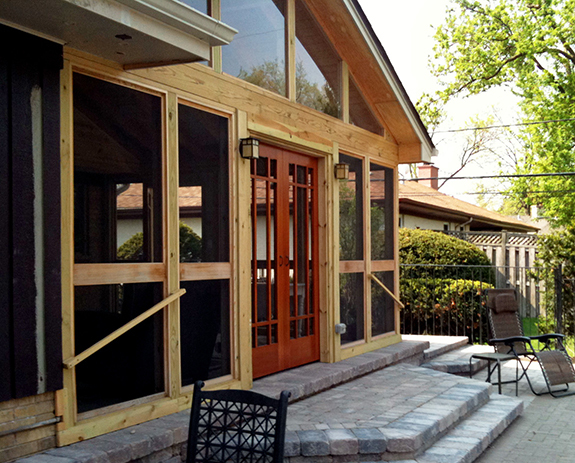 Archadeck of Chicagoland is a design and build firm. Every single patio we design is custom for each client. In creating each design, we listen closely to how the homeowners want to use their space. After determining the size and location, there are many options for the shape of the patio. We can work around the footprint of your yard. If you have your existing landscaping just the way you want it, we will work around and in symphony with your beds, trees and shrubs. You may have a beloved focal element in your yard such as a legacy tree. We can design your hardscape to work around the focal element. There are many options when it comes to the height of your patio. Your patio design can be multi-level, at grade, elevated, or spanning a grade change such as a small hill. One thing that’s important is considering how the new space transitions to your yard. Because patios are often the same level as your lawn, they create a beautiful and seamless transition into your backyard. While many Chicago-area homeowners refer to a patio as a paver patio, traditional brick pavers are only one of many building materials used for today’s hardscapes. We build with any number of natural and cultured materials including flagstone and other natural stones, material combinations, small boulders for retaining walls, slabs of natural stone for caps and tops, and of course brick or stone pavers. 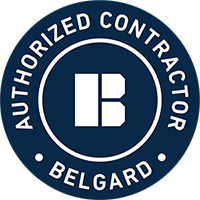 Here in Chicagoland, there are a number of paver and hardscape material brands we work with including Belgard and Unilock. While designing your project, we will recommend the best materials based on your design preferences. If you’ve found some ideas you love in magazines or online sites such as Houzz, bring them with you to your design consultation and we will help you bring the look to your backyard. Your paver patio can have any number of vertical elements serving your functional and aesthetic needs. These include retaining walls, seating walls, pillars, knee walls, planters, and flower beds just to name a few. You may want a particular structure custom built into your patio such as a custom fire pit, an outdoor fireplace or kitchen, bar, or grill surround. Not too long ago, most paver patios were in the red brick color family. Today’s selections include any number of different color families including beiges, grays, and even darker colors such as black and coffee brown. Often you will see a darker color used as a border or focal element on the paver patio or hardscape. 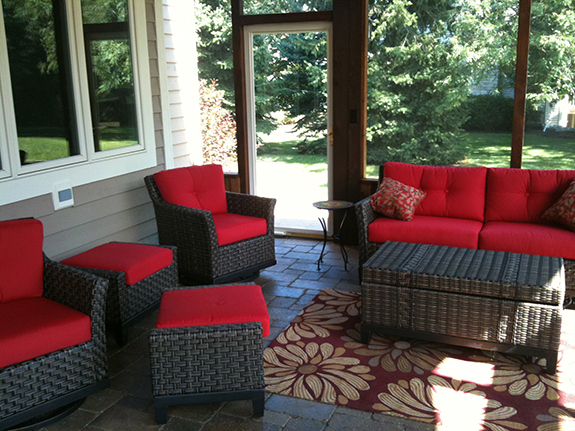 Chicagoland homeowners are not just adding paver and hardscape elements to their backyards. You will see paver pathways, driveways, side stoops, or steps leading to another level or another part of the yard. A paver or stone hardscape makes a beautiful transition from one part of your yard to another. Paver and hardscape stones come in any number of textures including cobbled, tumbled, smooth, or rough. When you come to one of our showrooms, we have samples for you to see and touch to determine which colors, sizes, and textures most closely match your vision. Can a patio stand alone? 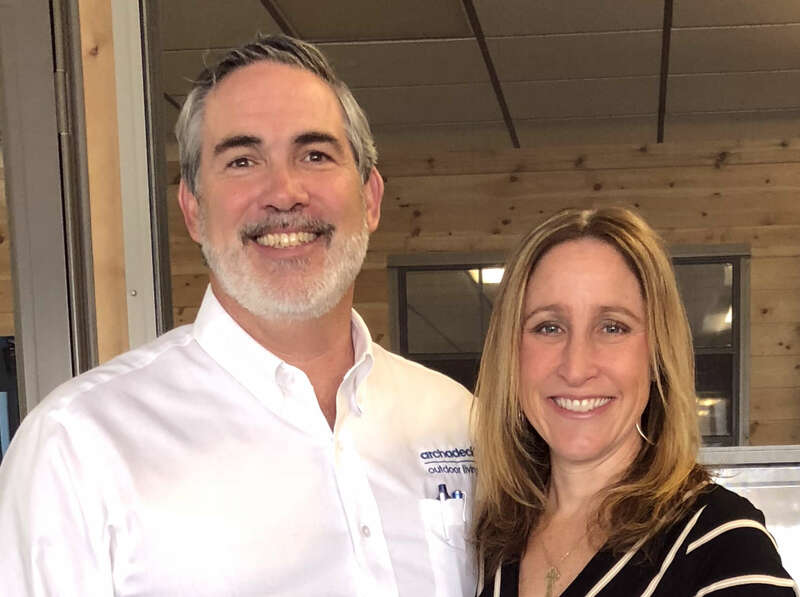 While you will often see a patio attached to the home or to a deck or porch, we also build patios that are detached out in the yard such as surrounding a pool or making way to a cozy backyard oasis that has an outdoor fireplace or other structure. Don’t be overwhelmed by all the options. 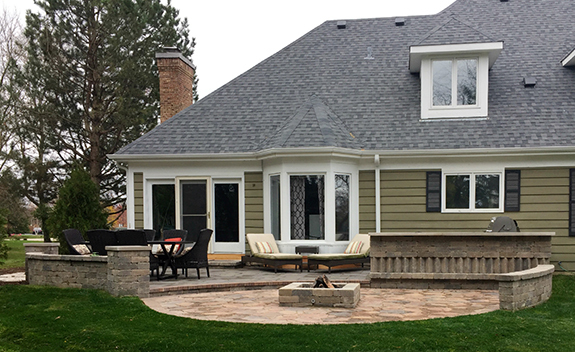 We’ve built many patios throughout the Chicagoland market and we’re here to provide guidance, suggestions, and a proposed design that suits your needs and wants. 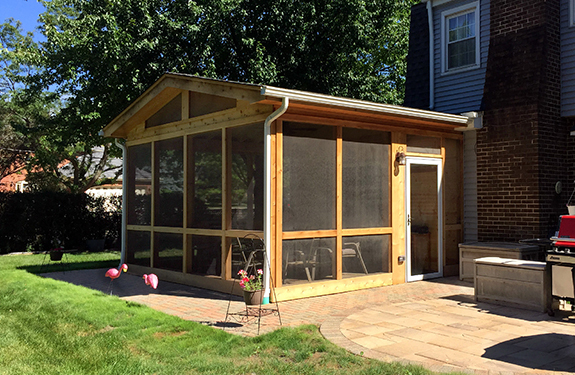 Give us a call for a free consultation about your new outdoor living area at one of our local area numbers: 847.749.2373 | 630.505.7688 | 708.873.1990. We look forward to hearing from you!